Juan Martin del Potro, of Argentina, celebrates his quarterfinal victory over Roger Federer Wednesday night at the US Open. NEW YORK — So much for the first US Open matchup between Roger Federer and Rafael Nadal. Federer failed to live up to his end of the bargain. Hours after Nadal did his part with an easy-as-can-be victory to get to the semifinals at Flushing Meadows, Federer was unable to join him for what would have been the most-anticipated showdown of the entire two weeks, wasting chances to take control and missing makable shots in a 7-5, 3-6, 7-6 (10-8), 6-4 loss to 2009 champion Juan Martin del Potro on Wednesday night. Federer entered the quarterfinals with an 18-0 Grand Slam record this season, including titles at the Australian Open and Wimbledon to raise his record count to 19 major championships. But he tweaked his back at a tournament last month, curtailing his preparation for the US Open, and he was not quite at his best for stretches. He needed five sets to win each of his first two matches — and Wednesday, he succumbed to the same formula of massive forehands and booming serves that del Potro used when he upset Federer in the final eight years ago. Before the tournament began, Nadal was honest as can be when asked whether he hoped to face Federer at the only Grand Slam tournament where they’ve never met. The answer, the No. 1-seeded Nadal said earnestly, was no — because he’d rather go up against someone easier to beat. Well, as it turns out, he’ll go up against del Potro on Friday, when the other semifinal features two men who have never been this far at any major: No. 12 Pablo Carreno Busta of Spain vs. No. 28 Kevin Anderson of South Africa. Nadal, who has won two of his 15 Grand Slam trophies in New York, overwhelmed 19-year-old Russian Andrey Rublev, 6-1, 6-2, 6-2, in the quarterfinals, then had to wait hours to see what Federer would do under the lights. ‘‘Well, I think it’s my home court, too,’’ del Potro said in an on-court interview. The 2-hour, 51-minute contest was filled with some sublime shotmaking by each player, and some real moments of shakiness for the 36-year-old Federer, whose forehand in particular was problematic. The turning point was the third-set tiebreaker, which Federer was a single point from winning on four occasions. At 6-4, del Potro hammered a good return that caught Federer off-guard, resulting in a forehand into the net. At 6-5, del Potro delivered a service winner. At 7-6 — set up by a double-fault from del Potro — Federer missed a backhand, and his wife, Mirka, put her hands to her temples, before standing to offer encouragement. At 8-7, Federer’s fourth and last set point, del Potro hit a huge forehand winner. That began a run of three points in a row for del Potro to claim that set, the last when Federer pushed a backhand volley long. The suspense in the fourth set was brief: At 2-all, Federer dumped an overhead into the bottom of the net to gift a third break point of the game, which del Potro converted with a stinging cross-court backhand return winner to nose ahead for good. 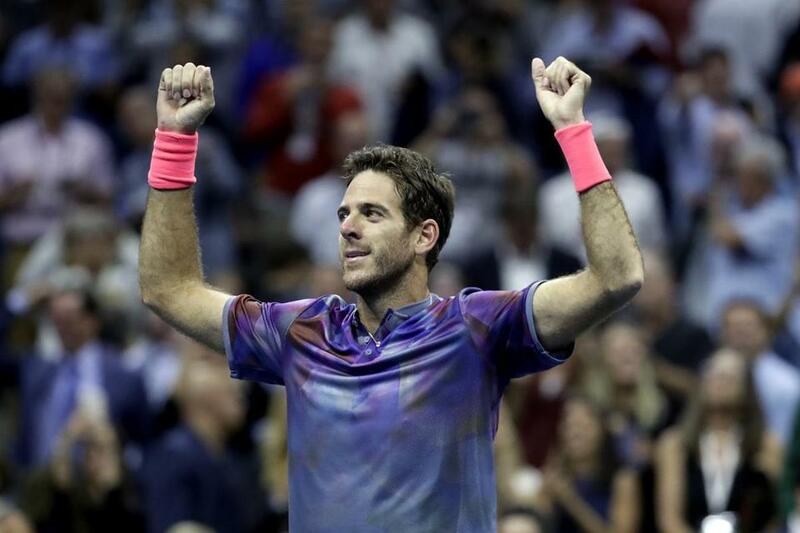 Del Potro showed no ill effects from his 3½-hour, five-set comeback victory in the fourth round — or the illness that’s been bothering him and had the 6-foot-6 (1.98-meter) Argentine coughing into a towel late in the second set. His forehands were powerful and precise, including one reflex pass hit so hard and so close to Federer’s head that he ducked out of the way. Federer was uncharacteristically off at moments, including a very bad forehand volley that was way off the mark and set up del Potro’s match point. Nadal, meanwhile, strolled past the 53rd-ranked Rublev. ‘‘He gave me a lesson,’’ acknowledged Rublev, the youngest US Open quarterfinalist since Andy Roddick in 2001. Rublev didn’t put up much of a fight, with seven double-faults among his 43 unforced errors. Truth is, the way Nadal is playing at the moment, few would be able to offer much in the way of a challenge. He has won his past three matches in straight sets, his uppercut of a forehand at its dangerous best.